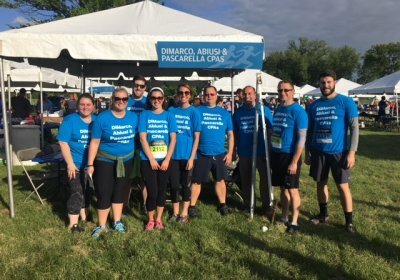 DiMarco’s 2018 Corporate Challenge Success | DiMarco, Abiusi & Pascarella CPAs, P.C. DiMarco, Abiusi & Pascarella CPAs, P.C. DiMarco, Abiusi & Pascarella CPA's, P.C. is a regional upstate New York accounting firm with offices in Syracuse and Ithaca, New York. Any time our team gets together success is inevitable, especially when we have fun! We enjoyed the 36th JPMorgan Chase Corporate Challenge event held June 6th at Onondaga Lake Park in Syracuse this year. Our team enjoyed the gorgeous late afternoon cheering on the runners and walkers from our firm. After the event we feasted on a variety of food catered from the Dinosaur BBQ at the firms tent. As you can see from our photo we had many participants and plan to grow our team next year. We even unintentionally coordinated our pants to all match! Sonia Rainbow, Sarah Morrison, Matt McArdle, Julia Bailey, AnaRay Losurdo, Christopher Boullosa, Troy Segar, Andrey Makarchuk and Drew VanRiper. Copyright ©2019 DiMarco, Abiusi & Pascarella CPAs, P.C.